It’s no coincidence that Whole Foods is often jokingly referred to as Whole Paycheck. The store can be a gourmet haven for the organic consumer, but if you are on a tight budget, it can also seem prohibitively expensive. 1. Buy by the case. Whole Foods offers a 10% discount when you purchase a case of like products. In most instances, a case equals 12 items, but check with a Whole Foods employee to make sure you’re buying the right number. Tell your cashier that you are buying a case, as the discount has to be manually inputted. And finally, find out what your store’s policy is regarding “like” items. At my Whole Foods, all items have to be the same flavor, but some stores are more flexible. Most Whole Foods stores allow you to stack manufacturer coupons with store coupons. Whole Foods store coupons are available online – or in the bimonthly newsletter, The Whole Deal, which you can usually find next to the store entrance. One thing you may not know about The Whole Deal is that although it comes out bimonthly, the coupons are good for three months. So, the March/April issue that is out right now has coupons in it that are good until May 31. It’s definitely worth it to hold on to the coupons for this extra month since I’ve noticed that many of these products tend to go on sale once the newsletter is no longer available. Whole Foods bulk items are already competitively priced, but when they go on sale, your savings are even better. You can find out about bulk sales via your biweekly sale flyer, available online or at your store. The key to bulk buying is having proper storage containers. Dried goods that get infested by bugs or spilled all over your kitchen floor obviously don’t save you any money! 4. Know your produce and meat prices. While many of the Whole Foods prices on fresh produce and meat can lead to sticker shock, there are always good deals to be found. Just don’t be lulled into thinking that all “sales” are good bargains. Know your target price per pound for produce and fresh meat/seafood so you can be ready to pounce when organic apples drop to $1/pound. 5. Sign up for email alerts. 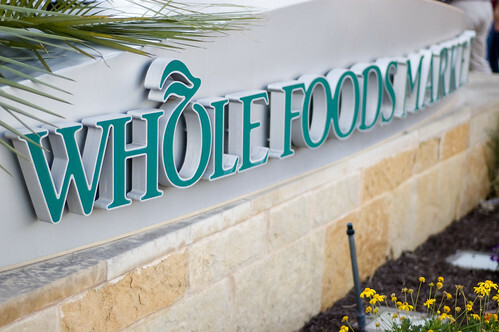 Whole Foods runs on a two-week sale cycle, but most stores have One Day-Only sales as well. To find out about these regional sales in advance, sign up for email updates from your local store. Just last Friday, many of us were able to pick up 30 beautiful tulips for only $12 thanks to a one-day sale! I recently learned that Whole Foods has a 100% Correct Price Guarantee. If the item is tagged at $9.99, for example, but rings up at $12.99, head on over to Customer Service and they will reimburse you the full $12.99. If you purchased more than one mispriced item, the first one will be free and the each subsequent item will be refunded at the adjusted price. If a bulk purchase rang up incorrectly, you will receive the first pound for FREE. According to the manager at my Whole Foods, this policy is regional, so be sure to ask about it at the customer service desk. Whole Foods gives one of the highest “bounties” for bringing your own bags — $.10 each. It’s not a ton of cash, but if you do a big shop, you can save $.50 or more. And just think: You’d clip a coupon worth $.50, wouldn’t you?! 8. Stay in touch with your store manager. Unfortunately, Whole Foods does not yet have a nationwide corporate policy for coupons. Most stores, for example allow you to stack coupons, but some don’t. If you would like to see more “coupon-friendly” policies at your store, politely share this with your store manager. The more they hear from organic couponers, the more they will realize that it’s a win-win for everyone. Are you a Whole Foods shopper? What strategies do you use to maximize your savings? You can leave a comment by clicking here. When she’s not shopping for bargains at Whole Foods, Mara Strom can be found blogging about them at Kosher on a Budget. She loves sharing tips and strategies for saving on organic (and kosher) food and showing people that it doesn’t have to cost a fortune to eat the way you want. I am in the process of changing to Vegan. I will be shopping here more and more. My store does allow you to stack and they are great about case prices. They even allowed to use a coupon plus the case price. Great post! Another thing I’ve noticed at my Whole Foods is that it can be helpful to browse the whole store, since there are often items on sale that are not listed in the “weekly buys” (either the online or print version). Whole Foods Atlanta markets will be TAX FREE April 18th to “celebrate” Tax Day! That’s about 4.5% savings for some of us in the metro area. I look for coupon pads around the store located by certain products. Last week I found $2 off any Tom’s product, which were on sale already. So….I got Tom’s large size toothpaste for only $2 each. Great deal! Thank you!!! This is definitely helpful! I didn’t know there was a case discount! I have been focusing most of my efforts at Publix, they do have a good selection and good couponing policies, but then I stumbled across you guys. Wow! My favorite goat milk mentioned case prices, but I did not know where to get it. Now I know. Thanks for the tips. I will check on the policies at my store next week, and make sure to get an extra copy of the newsletter. The key is to know your prices. There are many items that I can buy cheaper at Whole Foods than I can at Publix. Boneless Skinless Chicken Thighs are sold in sealed packages for less than Publix’s sale price. Ground beef often goes on sale for $3.99/lb – cheaper than Publix (At least here in Florida) and once went on sale for $1.99/lb. Plus their meat is of high quality. Organic rolled oats in the bulk bin are cheaper than the Publix store brand non-organic. Even cheese can be cheaper – although not as cheap as sale prices at Publix. Dubliner Irish cheese (one of my family’s favorites) is $2.99 at Whole Foods. Publix sells it for $5.99. The trick is to know your prices, resist temptation to the expensive items, and don’t shop during the lunch hour – way too busy. The case discount is awesome. Plus you don’t need to shop for the items as often (as long as you have the space).